Unexpected and Unusual Findings During Laparoscopic Roux-en-Y Gastric Bypass. How to Proceed? 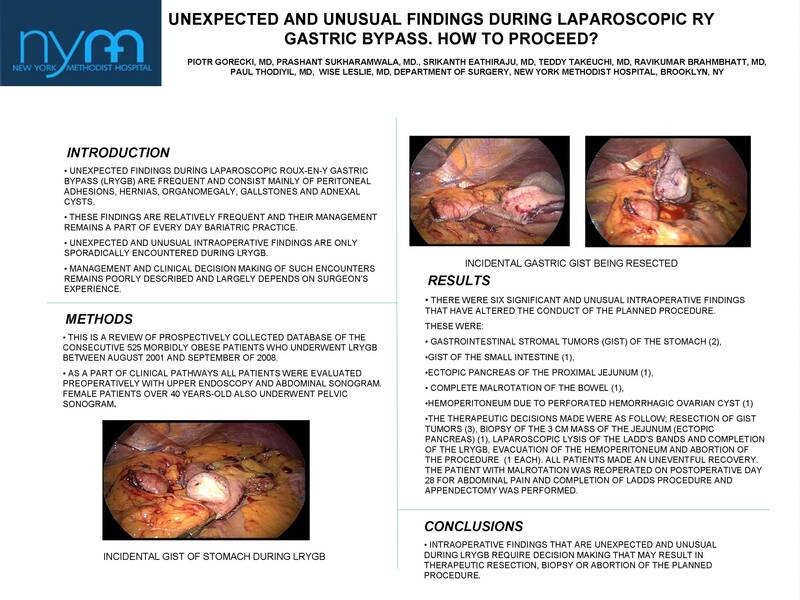 Introduction: Unexpected findings during laparoscopic Roux-en-Y gastric bypass (LRYGB) are frequent and consist mainly of peritoneal adhesions, hernias, organomegaly, gallstones and adnexal cysts. These findings are relatively frequent and their management remains a part of every day bariatric practice. Unexpected and unusual intraoperative findings are only sporadically encountered during LRYGB. Management and clinical decision making of such encounters remains poorly described and largely depends on surgeon’s experience. Methods: This is a review of prospectively collected database of the consecutive 525 morbidly obese patients who underwent LRYGB between August 2001 and September of 2008. As a part of clinical pathways all patients were evaluated preoperatively with upper endoscopy and abdominal sonogram. Female patients over 40 years-old also underwent pelvic sonogram. Results: There were six significant and unusual intraoperative findings that have altered the conduct of the planned procedure. These were: Gastrointestinal stromal tumors (GIST) of the stomach (2), GIST of the small intestine (1), ectopic pancreas of the proximal jejunum (1), complete malrotation of the bowel (1), hemoperitoneum due to perforated hemorrhagic ovarian cyst. The therapeutic decisions made were as follow; resection of GIST tumors (3), biopsy of the 3 cm mass of the jejunum (ectopic pancreas) (1), laparoscopic lysis of the Ladd’s bands and completion of the LRYGB, evacuation of the hemoperitoneum and abortion of the procedure (1 each). All patients made an uneventful recovery. The patient with malrotation was reoperated on postoperative day 28 for abdominal pain and completion of Ladds procedure and appendectomy was performed. Conclusions: Intraoperative findings that are unexpected and unusual during LRYGB require decision making that may result in therapeutic resection, biopsy or abortion of the planned procedure.